Pat on the Back to Posh Puppy! We are so excited and thrilled to have seen Posh Puppy and owner Jennifer Kirk on Good Day Sacramento and have some major air time that will give this wonderful company great exposure! On air, there was a great doggy fashion show featuring some of the Posh Puppy’s best sellers and fashion that every dog would want and every owner should get! Can’t you just see your little one in the Juicy Couture Hoodie or custom made Linda Higgins silk dress? 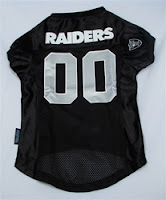 Or possibly you’re a sports fan and you would rather see your best bud in a doggy Raiders jersey! Either way, fashion is a MUST when having a doggy! 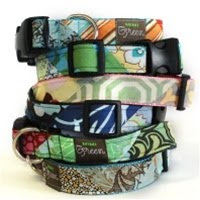 Posh Puppy also carries great dog accessories like collars, leashes, pet training, beds and lots more! Why not join in on the fun and get on the Posh Puppy bandwagon and get your family friend a outfit that will make him strut!! Posh Puppy has made some huge strides in the last month or so with their new store in Westfield Mall in Roseville, California. This great upscale doggie boutique is located near JCrew in center court on Level 1 in this unbelievable renovated Mall. Again, Congratulations and Good Job Posh Puppy! At some point in your life, or your kid’s their main Christmas/Birthday request has been a new puppy! I use the same response, "We will see".. but it gets old and they just keep asking. Why not really, a dog is one of the great pleasures of life. If you are considering giving in to your kids and getting a new puppy there are some things to think about before taking the big plunge!!! Think about what your family wants and what their needs are. What is your lifestyle? Make sure that when you go to pick out a doggie that you match your family to that particular pup. If your family is laid back and mellow, choose a dog that is low maintenance and doesn’t require hours of brushing, grooming and exercising. If you have a small apt or small house or space, choose a smaller dog. There are many articles about breeds of dogs and which ones are best for your family. Make sure your family is aware of changes that will occur when Fido enters th e family. There are responsibilities that come with being a pet owner. Set guidelines for the kids and make a list of who feeds him on what day and make it a family chore. Make sure that the kids know that life will no longer be the same for the good and the bad when you own a pet. Who will have Poo Poo pickup? Who will walk the dog? Who will wash the dog? The fun begins! Time to go and buy the items that the little pooch will need. If buying a puppy, try great housebreaking items, and you may need a crate if planning to crate train. You will need dog food, treats, bedding and a dog brush to brush him with. Buy your collar (there are some great ones out there) and your leash and please don’t forget clothes! Doggies require fashion too! A dog is a blessed addition to families~ and kids get many hours of enjoyment and friendship from a pet. Think of adopting a pet from a homeless a nimal shelter or buying from a rescue group, I think in the long run your family will be so happy to have saved a dog and got a best friend at the same time! New York, New York! Positively New York is the place to be on August 22nd and 23rd if you are a pet owner and love pet fashion. Pet Fashion Week NY 2009 will hold their 4th annual fall event to be held at the Metropolitan Pavilion in NYC. Pet Fashion Week NY is “market” or “tradeshow” of pet accessories, apparel, and lifestyle items from all over the world! 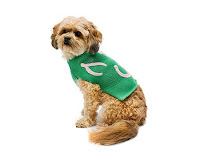 You can purchase and sell the top pet products in the pet world. Each applicant goes through an application process to ensure the integrity of this event. Apparel and many more vendors! If in the NYC area August 22nd or August 23rd check this pet friendly event out! Pet Fashion doesn't get any better than this! Check out what others are saying about this upscale pet fashion extravaganza! Tired of trying to keep the family pet off the furniture or having pet hair all over you when you get up from the couch? Or... little dents in the leather couch from their nails? We NOW carry the product that everyone is talking about, The Petzoff Furniture Protector! This great new product looks like a beautiful blanket on one side and a foil like material on the other side. 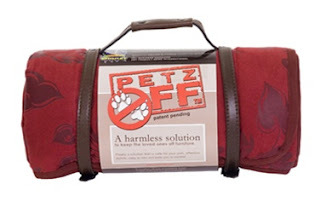 The Petzoff Furniture Protector is 56"x72" and made of 100% cotton . For some reason, pets do not like the “foil” feel of the on the other side.Comes in great designer color choices and is affordable and safe, what a deal! Harrison Forbes, the Pet Talk host and an internationally recognized animal behaviorist named Petzoff Furniture Protector as the "best pet product of 2008" and this wonderful safe product for dogs was chosen among thousands of pet products for the Editor's Choice Award by Pet Business, one of the top publications for the pet industry, in its June 2008 issue. Go ahead, give it a try and let us at Doggie Couture Shop know what you think of this great new safe product for dogs and cats! We all know someone that is disable or might have someone in our family that is disabled, all the way from being blind to having a learning disability. Disabilities come in many fashions and affect people of all shapes and sizes. When walking down the street you might find yourself staring for a bit or maybe your child stops and looks for awhile, that is because we often don’t teach our kids about people who are disable and what it might be like for them. Its not necessarily a bad thing, its a human thing. On August 22, 2009 a wonderful event is being held to that will benefit all to understand disabilities and what it is like to have a disability. A Touch of Understanding (ATOU) has a wonderful Youth Force that is having an event Paws with a Cause from 11-1pm at Mahany Park, 1545 Pleasant Grove Blvd in Roseville, Ca. This event will help raise money in the Youth Force’s mission to spread the word about disability awareness to all. 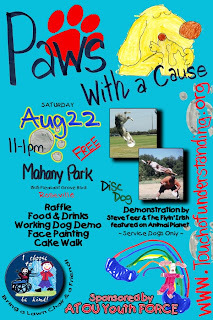 Disc Dog Demonstration by Steve Teer & The Flyin' Irish - featured on Animal Planet and a Raffle! A special Thank You to our very own Jennifer from Posh Puppy Boutique for donating to this wonderful time! Grab a friend and head to the park for a day of fun~ if you can’t come, please consider donating to a great organization or Volunteer to help the Youth Force on their mission to spread the word about Disability Awareness. Back to School blues for Fido...? Laying around the house, swimming, playing outside, watching TV… that was such good times this summer for your dog and your kids. We (parents) are not the only ones who feel the "empty nest" when the kids go back to school. There are some signs to watch for when your dog experiences the "doggie back to school blues". The kids are with their playmate most all summer and suddenly their gone, you need to watch for signs and symptoms early on. ~Start early paying less attention to him early making the transition easier.~Give them something to do during the day.. leave toys such as the Kong and the and then rotate during the week. Make sure the toys are high quality and indestructible so that he cannot hurt himself during the day and the toy will hold his interest. 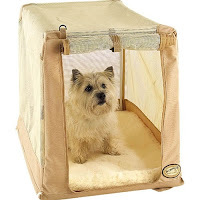 ~Create a “home” or “place” for your dog to call his own - get a dog crate, or make him a bed (with “his” blanket) in the laundry room and/or get him a nice doghouse. Pets must feel as if they have a “retreat” to go to. For more information on pet separation anxiety visit the ASPCA webs ite and in the meantime, please remember that Fido is not mad or acting in anything other than separation anxiety and missing you and the kids. Be patient, this too shall pass. In Pontiac, Michigan breaking news today was regarding the outbreak of Parvo (parvovirus) in dogs and about how Parvo has taken the lives of hundreds of dogs this summer. The Detroit Free Press reports that shelter workers in Detroit and Flint have also had outbreaks and it is the worst she has seen in years and even Houston, Texas is showing signs of the outbreak. 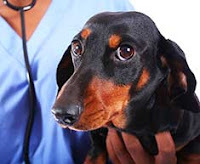 Parvo affects dogs by contact with feces (pet waste) from other contaminated dogs and most of the time die after several days after symptoms appear. Parvo is a viral disease and can be highly contagious and should be prevented by a regular vaccination by your vet. Puppies get Parvo more often than adult dogs and is carried by one dog to another. The vomit and feces of an infected animal can live outside the dog’s body for as long as 10 months. Some adult dogs can have this horrible disease and show no symptoms but be a carrier transmitting to other dogs and animals. Families that are lower income are more susceptible to their pets having diseases because they tend to skip vaccinations and regular dog upkeep and care. There are many vaccination clinics and many of the pet stores in your area that run “specials” on vaccinations, so if you cannot afford your dog to have their shots, please visit one of these portable pet care events. Call your area’s animal shelter and find out what event's are going on in your area. The Humane Society of Southern Arizona offers vaccinations twice a week for $10.00. Without treatment 80% of infected animals will die.